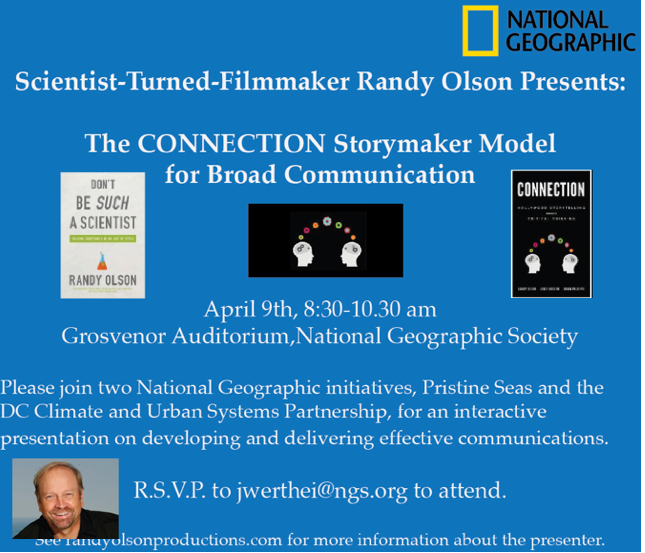 I’ll be presenting the in-depth 2 hour work session of our Connection Storymaker workshop in the Grosvenor Auditorium at National Geographic headquarters on the morning of Wednesday April 9 starting at 8:30 a.m.(ugh, but yay!). It’s a lot of fun and packed with a great deal of very useful and practical information. And will be free — you just need to RSVP to jwerthei@ngs.org. Hope to see you there! THIS IS HOW WE DO IT. If you’re brave enough to make it there by 8:30 I promise to be awake enough to make it worth your effort. TIME FOR YOUR MORNING ABT! The centerpiece of our CONNECTION Storymaker Workshop is the 2 hour “Big Show” extravaganza that Dorie, Brian and I have presented at numerous locations. Sometimes I do the whole thing myself, as I’ll be doing at Nat Geo Headquarters on the morning of April 9. The first hour is Narrative, the second hour is Improv with a few small demonstration exercises (just a couple people up front to convey the concepts). The good people at Nat Geo will be sponsoring this and making it free to anyone who wants to take part. It’s fun, but also very practical. We’ll get into the Connection Storymaker app a little bit. And there will be lots of time for questions and discussion. #347) Confirmation from Climate Skeptic Marc Morano: Bill Nye is on fire! Not only did I get to see the stunning new “Bill Nye Phenomenon” in person last Saturday, we now have (below) the first hand testimony from “the enemy,” uber-climate skeptic Marc Morano, who is seeing the results of Bill’s apparently very savvy decision to do the Ken Ham debate. The “don’t engage” advice some scientists offered up might have seemed like the safe pathway, but the truth is the only long term hope for evolution winning the popularity polls in America is for there to be some BRAVE leadership. Bill Nye has demonstrated this by taking a major chance, defying his critics, and is now rightly collecting his accolades. In the bigger picture, the science world needs to realize that communication does not follow the same dynamics as research — it’s not about peer review, it’s about courage. NEWFOUND RESPECT. Bill Nye is becoming the 500 lb. media gorilla the science world has dreamed of. Marc Morano was one of the stars of my 2008 movie, “Sizzle: A Global Warming Comedy.” I have never agreed with his politics and even challenged him in the movie. But I have a great deal of respect for his basic intuitive understanding of how mass media works in America. He understands it is first and foremost an entertainment medium. As does Bill Nye. MARC MORANO: Randy, you are spot on about Nye being a rock star now. I witnessed it first hand yesterday during the Fox news taping. Nye was also a guest on this libertarian show, The Independents, and the hosts were so enamored with him they did not really challenge him on global warming because they were in awe of him. 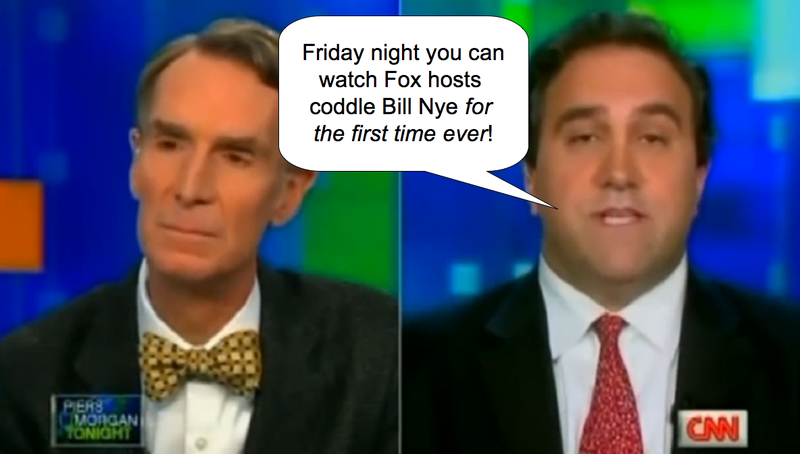 Nye is given access to Fox now to promote global warming uncritically due to his new status. I was skeptical of your blog a few days ago, but now I saw it first hand. The show will air Friday night at 9 pm and 12 pm EST, and you can watch Fox hosts coddle Bill Nye for first time ever. Stop the presses! Academics endlessly want TV and the movies to be informational media where they can just “present the facts” and have everyone take notes. Carl Sagan knew it wasn’t that simple. Neil Degrasse Tyson knows this. And now Bill Nye has demonstrated that he knows it better than anyone else in the world of science. And yes, I still trade emails with Marc Morano. There is nothing immoral about this. Lots of academics think it is. They desperately seek a villain for their basic narrative. One fundamental rule they gave us in film school is that “your story is only as good as your villain is evil.” So they do their best to make their story better by making Morano as evil as possible. But he’s not evil. He is a long time libertarian, and as such does his best to fight the government’s effort to respond to climate change. Which draws him into televised debates about global warming. Which has paired him up with Bill Nye on several shows. I think it was reasonable for some scientists to take an initial shot at discouraging Bill Nye from taking part in the debate. My first instinct was to question it as well. But it’s now time to concede that he was right, the critics were wrong. 100% Bill addressed the criticism on Saturday — the suggestions that of his debate with Ham supposedly “helped the enemy” with the funding of their creationism park. The amount of money the creationists have been able to raise off the debate is not significant. And more importantly, it’s trivial compared to the media boost Bill has now received. Carl Sagan in his prime never had this sort of mass support and wild enthusiasm. Bill Nye, like him or not, is creating the “trusted and liked” broad voice that the science world has lacked. 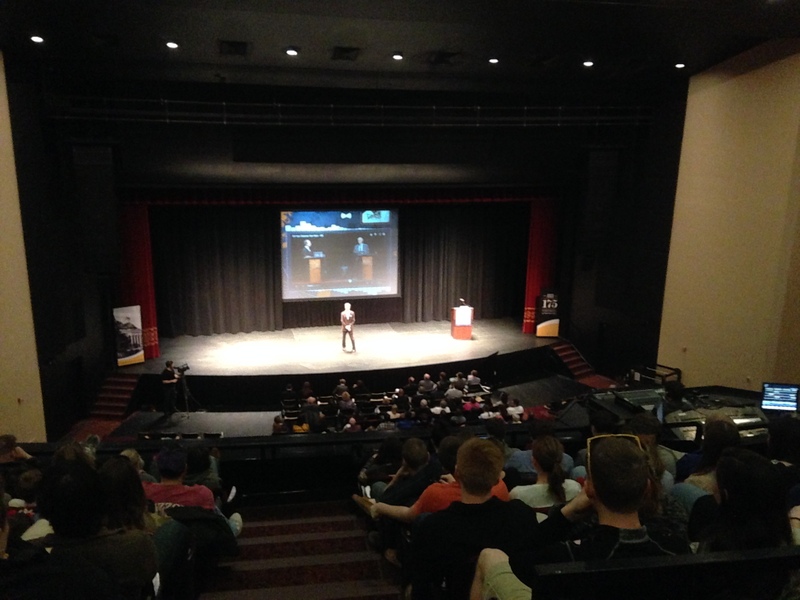 On Saturday I saw the phenomenon live and in person at the University of Missouri’s “Decoding Science” event that I took part in (which was excellent!). He filled the 2000 seat auditorium on Saturday morning where I literally arrived 10 minutes late, could not find a seat, so had to watch most of it on the TV monitor in the lobby. The audience went bonkers — cheering him for the Ken Ham debate, roaring with laughter at the corniest of jokes, then in the Q&A students asked him for Hi-fives, selfies and other hero-worship gestures. I guarantee you this is the result, more than anything else, of his having done the Ken Ham debate. I’m coming to the conclusion, goofball or not, he is perhaps more media savvy than anyone else in the ENTIRE world of science, and certainly far more than the scientists (with virtually no media experience) who have been taking potshots at him in magazines and blogs. Go Science Guy! BILL NYE, THE MEDIA GUY. The top is my view from the doorway in the upper balcony — no seats even up there. I really couldn’t believe the size and level of enthusiasm of the audience. And he was great with them. And there’s something else — at the private lunch afterwards for the speakers and about 20 university honchos he was the nicest, humblest guy. He may be a cornball, but the fact is he’s very sincere, endlessly enthusiastic, and knows how to play into the broadest of narratives. He is the guy the science world has been needing. The first thing to know is that Bill Nye isn’t an overnight sensation. His media career is at a tipping point due to a masterplan he conceived of many years ago when he first created his bow-tied unashamedly nerdy public persona with his TV show. What’s more important to realize is the way he has created a “brand” for himself that he has kept rigidly consistent and is now reaping the benefits of. The loudest media voice for the climate skeptics these days is my “Sizzle” star Marc Morano, who has appeared repeatedly on Piers Morgan on CNN. For the science community, Bill Nye is now the loudest, broadest climate voice. Gore doesn’t seem to be interested in the job any more, while none of the scientists who know the facts best have the media skills or stature to reach the masses. Bill Nye is the guy. Previously Nye has debated Morano on more than one occasion, and probably kind of lost because Morano is such a media animal who is fun, energetic, vicious at times, and most importantly capable of explosive verbal diarrhea that can’t be contained. But I bet the day is coming when he won’t be able to hold a candle to Bill. The defeat of Morano by Nye won’t ever happen through content — there’s no way to beat “the Gish Gallop” through substantive argumentation. But it is possible for Nye to become such a media monster that it turns into David vs. Goliath, where Morano is David who just gets stepped on. Just think of a high school kid debating Bill Clinton. The kid might get in a couple of funny zingers, but the odds are almost infinitely small that the kid could ever put a dent into such a massive media icon (though there are much greater odds today in the internet era than in the past). Same deal for Nye. Which is why the most important scorecard from the Ken Ham debate was what it did for Bill Nye’s media stature. He’s now huge. Smart guy. 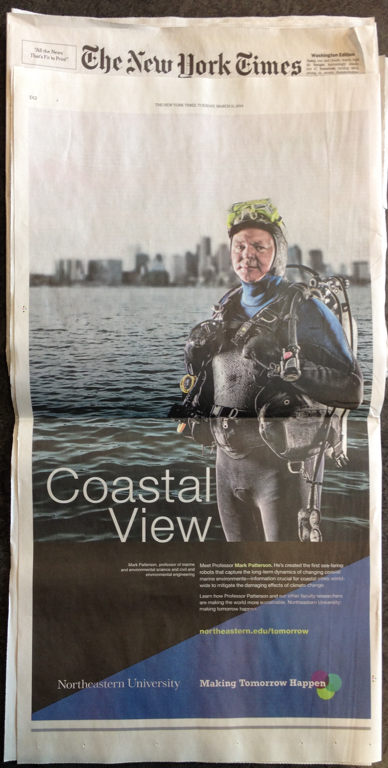 My old officemate, Mark Patterson, has a full page ad in yesterday’s NY Times. Actually, it’s not his ad, it’s for Northeastern University. But it’s great — an exercise in putting a human face on science, for which he is the best! THE OMEGA AND ALPHA: My old officemate, Dr. Mark Patterson, is the poster child for Northeastern University in yesterday’s NY Times. He’s just moved there after many years at the Virginia Institute of Marine Sciences. If I had to pick a favorite scientist and best teacher of all time, he’d be the guy. And on the right is the same guy, same outfit, with me a mere 36 years ago. 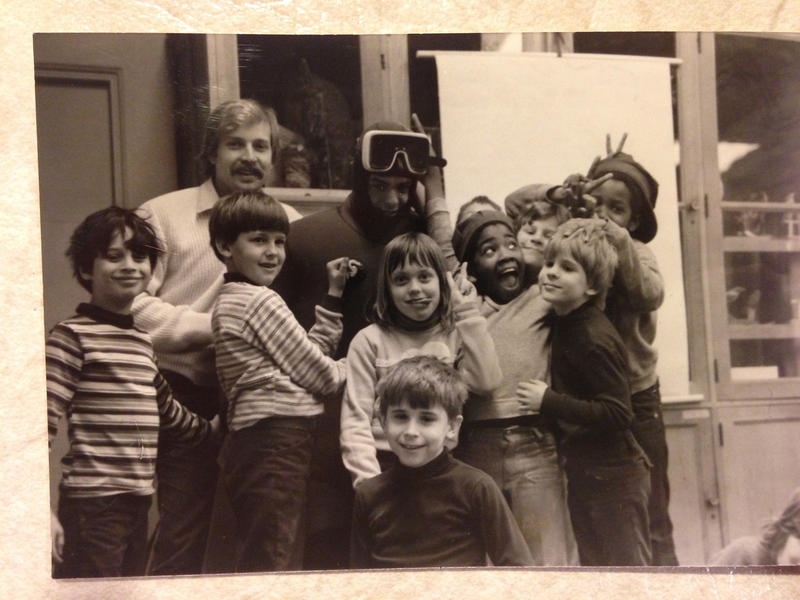 My first year of graduate school at Harvard I taught an after school class for these lunatic kids in the Museum of Comparative Zoology called, “Creatures of the Deep.” One afternoon we were looking at deep sea fish in jars when all of a sudden THE Creature of the Deep burst through the doors with a sign taped on his chest saying CREATURE OF THE DEEP. The kids of course went insane, as you can see from this photo minutes later. They must now all be in their 40’s. Yeeks! As a lot of people are coming to realize, we have broken new ground in the past year with the ABT, and are seeing the power and breadth of application of this template. 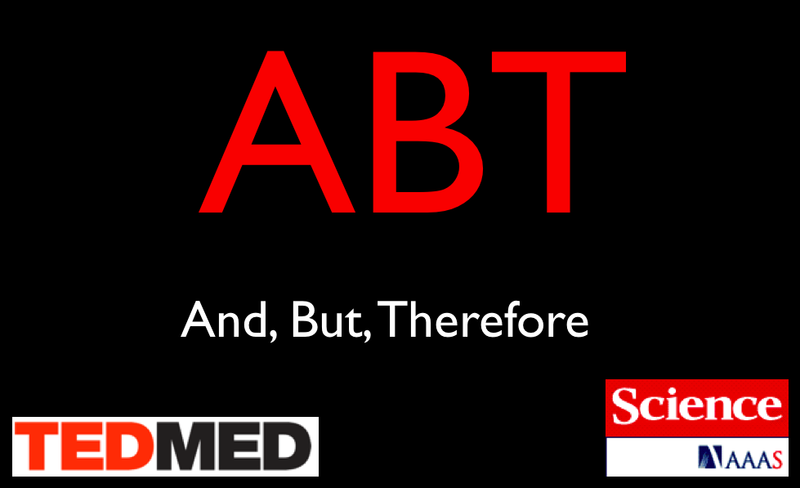 The ABT is not a “tip” or a “tool” to add to “your communications tool box.” It is an ENTIRELY different way to approach communication at all levels. Just look at this quote from a participant in our workshop two weeks ago at the Ocean Sciences Meeting in Hawaii, “I found myself Wednesday afternoon wandering through the poster session, reading abstracts and recognizing ABT (or not). You have me thinking in a different way.” That’s it — “The ABT Way of Thinking.” Here’s some more details on what he and I mean. ABT FANATIC. In my movie, “Sizzle,” climate skeptic Steven Hayward says, “the definition of a fanatic is someone who won’t change their mind and won’t change the subject.” I’m becoming an ABT fanatic. And may have to seek therapy eventually. In the meanwhile, you can learn more about it in my TEDMED talk and Science Letter of last year. WHAT’S YOUR WAY OF THINKING ABOUT COMMUNICATION? Most people would probably answer this with an innocent, “I dunno.” I think I would have a few months ago. But I’m now coming around to this idea of “The ABT Way of Thinking.” It’s very simple, and starts with just these three words of “and, but, therefore” — a way of thinking that I have now tracked back to at least the mid-80’s in the teachings of a major screenwriting professor. And of course the logic goes back to the Greeks, proving that “nothing is new under the sun.” And yet … a lot of stuff actually IS new under the sun (I’ve always hated the cynical tone of that line). Here’s a start on the ABT Way of Thinking, beginning with the words themselves. If you spend some time fiddling around with the ABT template, you begin to get sensitized to all three of the words. We see it all the time in our workshop. People start to feel self-conscious about saying, “Aaaand …” And … that’s a good thing. Boring people go on and on with, “and, and, and …” This is the first step to curing the boredom — by starting to develop some awareness of the basic narrative structure, or lack of it, in what you’re saying. The brain waves are minimal through the blah, blah, blah. It’s on the word “buuuuuuut” that everything lights up. In the Neurocinematics work of Uri Hasson that I’m constantly citing, this first part is the equivalent to the non-narrative footage of people walking around Washington Square Park. It’s when you say, “buuuuuut,” that you’ve established the source of tension or conflict and thereby taken us into the narrative world. Now the dynamics are more like the clip of Hitchcock’s, “Bang, You’re Dead,” in Hasson’s study. All of this results in ABT users developing a sensitivity to the word “but.” You can see them smiling, emphasizing it when they say it, and responding to it when they hear others say it. You can actually see a couple examples of Mike Orbach doing this in our wonderful CERF Sea Level Rise panel of last fall. I know at least once, and I think maybe even twice, he said, “THEREFORE …” as a means of wrapping up his point. In fact, I recall him saying once, “Therefore — there’s always a “therefore”!” He got it, on the power of the therefore. It’s just three words, but they really are that powerful. AND … they are an actual mechanism to take you into the telling of a story. And THIS I am coming to realize is a huge, huge, huge problem across the land. Everywhere I go now I’m hearing from groups who have had some previous speaker or communications consultant who had implored them to, “Tell stories!” But I’m not hearing of anyone out there who is presenting the mechanics or a model that take you into story mode. I’m really interested in hearing about it if anyone knows of a competing model to our WSP Model. But I’m just not hearing it. And in the meanwhile, people from our workshops are indeed reporting back to us how the ABT changes their entire approach to communication. Which is exactly what is needed to fight the boredom! #343) Is Everyone Following the Rise of Bill Nye? SOLD OUT. 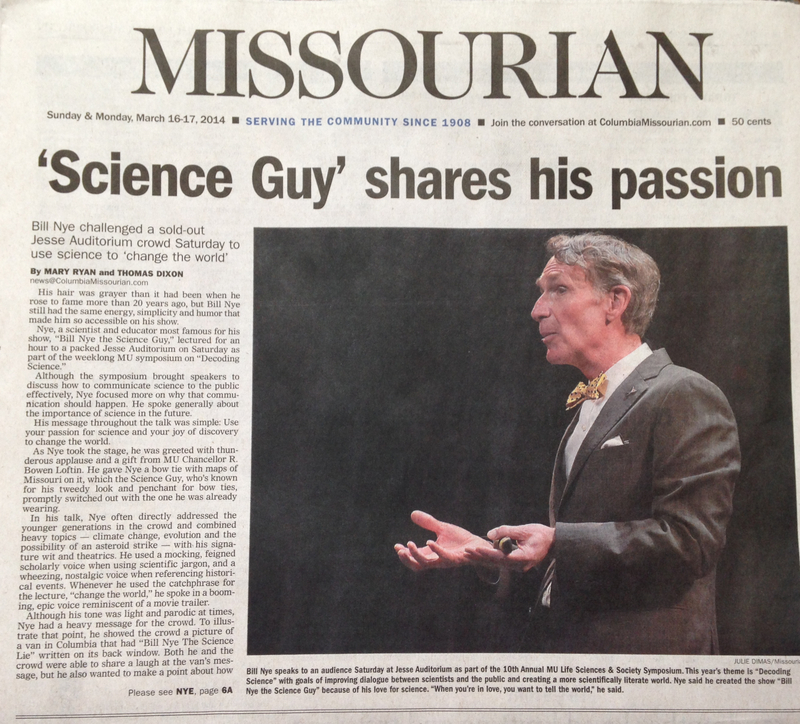 That’s the official word on Bill Nye’s talk next Saturday at University of Missouri for their “Decoding Science,” event where I’ll be one of the speakers. They have him in an auditorium that holds several THOUSAND. They told me he sold out an 8,000 seat venue at Oklahoma State University a week ago. Is everyone following this? Has there EVER been a voice of science that is this big of a draw? The rise of his popularity is a potentially great opportunity for the science world. OR … a chance to undermine him as the National Academy of Science did to Carl Sagan. Could go either way. OVERFLOW SEATING ONLY. This is a guy in his communication prime. Everywhere he goes now, he’s packing auditoriums of thousands of people. USA Today mentioned a month ago, when Bill Nye “debated” creationist Ken Ham, that his speaking fee is now $50,000 to $75,000. Which is pretty staggering. But what’s more staggering is what I just heard — that he’s drawing MASSIVE crowds to his university appearances. But why not. Here’s one thing I know — I keep talking to graduate students in our workshops — they pretty much all have a longstanding fondness for the guy. It makes me think of a couple years ago when I visited the Ithaca Sciencenter and they told me about how they now have college students who come back to town to work with them specifically because they basically imprinted on the place as children and now have this warm, nostalgic fondness for it. Same deal with Bill Nye. Today’s grad students were raised on Bill Nye the Science Guy. Even the journalism grad students at NYU two nights ago after my talk there were saying the same thing. The guy has put in the years. He is now THE voice of science that is TRUSTED and LIKED — the two things Daniel Kahneman said are most needed. I sure hope the science world gets it this time. Jerry Coyne has an article in The New Republic blaming Bill Nye for how his public debate with creationist Ken Ham has supposedly backfired by “subsidizing the enemy.” I’m not so sure. There is a bigger picture at work. Ask your neighbor Gerry Graff, at University of Illinois, Chicago, author of “Beyond the Culture Wars: How Teaching the Conflicts Can Revitalize American Education,” and “They Say, I Say: The Moves That Matter in Academic Writing.” Look at Elizabeth Kolbert’s article this week in the New Yorker on how to succeed on the SAT exams. We are a society awash in information where argumentation is now essential to “advancing the narrative.” The dumb creationist park is collateral damage. What’s more important is building a major mass media voice for science like Bill Nye who can argue the cause of evolution at the highest level. REALLY? Is the world that simple? Don’t you think there’s some larger scale to this problem? Pick your poison. What would you rather have, a world with no silly creationist theme parks, or one big, loud, effective, widely heard, widely cited mass media voice for science. Actually, you don’t get to pick — you’re getting both. Bill Nye the Science Guy “debated” creationist Ken Ham. Evolutionist Jerry Coyne tried to dissuade him from doing it by publishing an article in The New Republic titled, “Four questions about Bill Nye the Science Guy’s Evolution Debate.” I emailed Bill, citing the longstanding rule of thumb of Genie Scott (longtime director of the National Center for Science Education), suggesting he use the opportunity as “a teachable moment” by withdrawing from the debate the week before saying it’s a general rule that no one should “debate” a creationist. He replied that he had a strategy to carve up his opponent. The “debate” went off. It was a snoozefest, but did score plenty of media coverage, and as I discussed in it’s wake, the IMDB Pro Starmeter rankings (one rough but somewhat accurate metric for media popularity) shot up for both of them. Now Jerry Coyne has followed up in the New Republic painting a picture of an idea gone wrong, even grabbing an “I told you so,” out of the whole event. I remember clearly 2005 when the conflict over intelligent design got the subject of evolution on the cover of every magazine and talked about on every news show. The “enemy” are largely hapless, but they do serve as a foil to help present evolution as a culturally relevant topic rather than obscurantia of the science world (which is what is slid back into in the years since then). And that can result in science having the sort of major societal voice that is dreamed of by academics. This was the problem with ClimateGate. The skeptics stole the emails, Fox News became their instant mouthpiece, but all the climate science crowd had was a bunch of humble bloggers who calmly said, “Give it time, you’ll see there’s nothing to this.” But within a couple days Jon Stewart was ridiculing the entire science community for their inability to answer the scandal. I think if that happened today there’s a decent chance Bill Nye could hold a press conference and be the equal and opposite voice of Fox News. Who cares about the dumb creationist museum. There is a need for these singular voices of leadership for the science world, and the fact is, The New Republic is not an effective voice to counter-balance Fox News. Nor are the AAAS or NAS — they’ve shown that repeatedly with the attacks on evolution and climate. But Bill Nye is getting there. I recommend everyone look at things in this larger context.